Leadership Washington Focus (LWF) is a National 4-H leadership conference for youth ages 12-14.Youth can exchange ideas, practice respect, and form friendships with other 4-H'ers from across the nation. Youth ages 12 to 14. Delegates must be at least 12 years of age by time of travel to participate. You do not have to be a current 4-H member to participate. Please contact Scott Mautte at ca4hwashingtonfocus@ucanr.edu if you are not a current 4-H member. 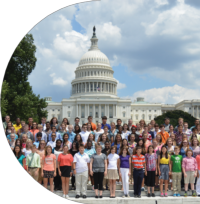 This 5-day trip is packed with educational adventure as participants tour our nation’s Capital and learn life-changing leadership skills in a conference setting. The program will take place at the National 4-H Youth Conference Center, just one mile from the Washington, D.C. border. Experience hands-on learning using the historical backdrop of Washington, D.C. Participants are immersed in the culture and history of our nation through on-site workshops at D.C.’s most spectacular sights. Please see the Leadership Washington Focus event page for the full timeline of payments and required webinars to participate in this trip.